Present state: The main station building and part of the Richmond platform survives as a private residence with few alterations apart from an extension to the west end of the building. The Darlington platform is also extant and the track bed between the platforms is now a private drive. The platform has been partially restored with a replica running-in board. The station clock facing onto the platform has been restored. 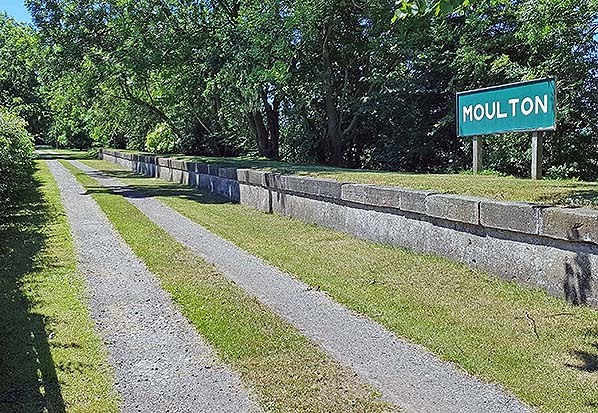 Notes: Moulton was the first station on the branch; despite being only about a quarter of a mile from North Cowton the station was named after the village of Moulton some 3 miles away. 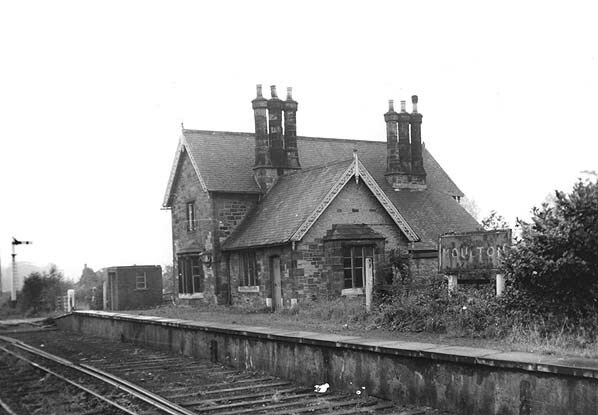 This was to avoid confusion with a now disused station on the East Coast Main Line named Cowton serving the nearby village of East Cowton. goods yard was served by a single siding to the rear of the Richmond platform ending at coal drops. The rear of the passenger platform formed a loading dock. At some time the two platforms were extended at the west end with timber decking. This extension is higher than the earlier platform. 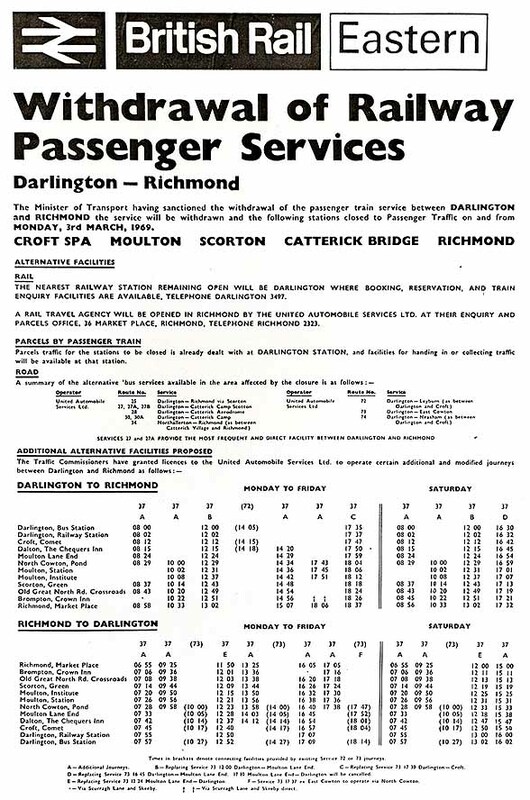 Moulton lost its goods service on 1st October 1956 and at the same time was downgraded to an unstaffed halt although a crossing keeper was retained. the end of the year a fourth daily train had been added with three on Sunday. The York & Newcastle Railway only survived for a further 7 years after the opening of the line, becoming part of the North Eastern Railway in 1854. 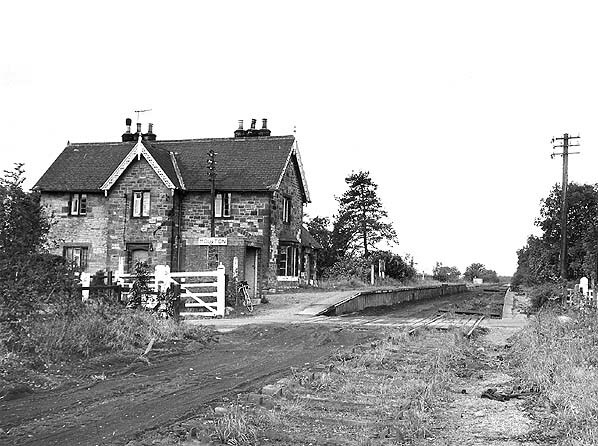 The level of service remained much the same until WW1 and the opening of the 4 mile steeply graded Catterick Military Railway from a trailing connection at Catterick Bridge station to Catterick Camp two miles south of Richmond. The idea for a military camp in the area had first been proposed by Lord Baden Powell in 1908 but construction didn't start until 1914 a few weeks after the outbreak of WW1. 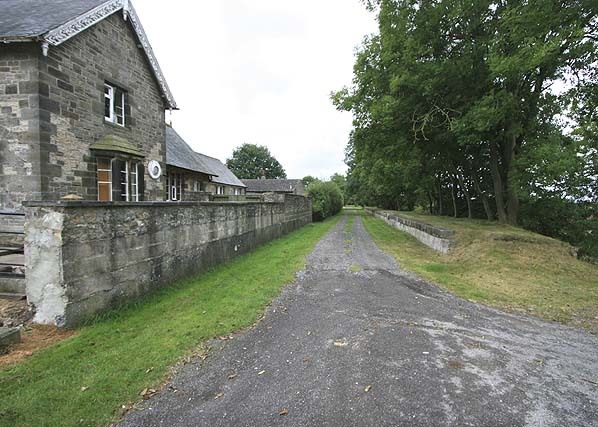 During building of the camp, a 2' gauge contractor’s line was built from Catterick Bridge. This was completed by May 1915 and converted to standard gauge by the end of the year. 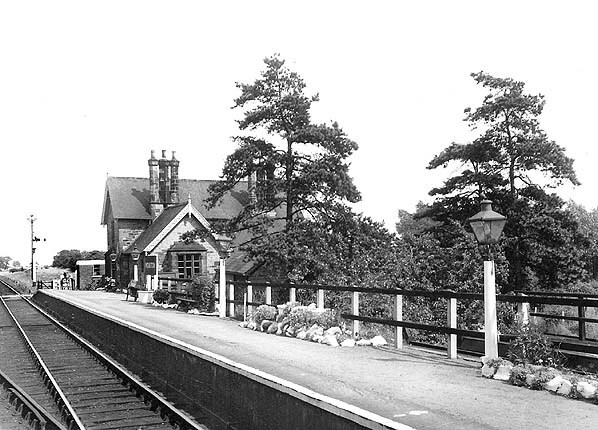 Stations were provided at Brompton Road, close to Catterick Bridge Station, Camp Centre, California and Scotton. Although built to light railway standards all locomotive classes were permitted on the line which was also capable of carrying the large cross-channel railway guns used in WW2. trains between Catterick Bridge and Camp Centre. Some trains between Camp Centre and Darlington were combined with trains for Richmond dividing at Catterick Bridge where the camp's own tank engine was waiting to haul the detached coaches on to Camp Centre. The camp's tank engine was kept in a 2-road corrugated iron shed opened in 1915. It stood south west of Walkerville Crossing and closed in c.1925. military trains), between Darlington and Richmond. 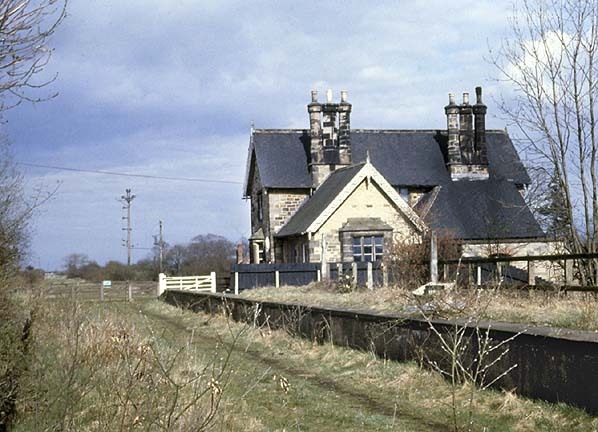 Following objections, the proposal was rejected and trains continued to run although passenger services to the camp ended on 26th October 1964 although 'leave' trains continued to run toCatterick Bridge station for a little longer. Croft Spa, Eryholme, Scorton, Catterick Bridge & Richmond. 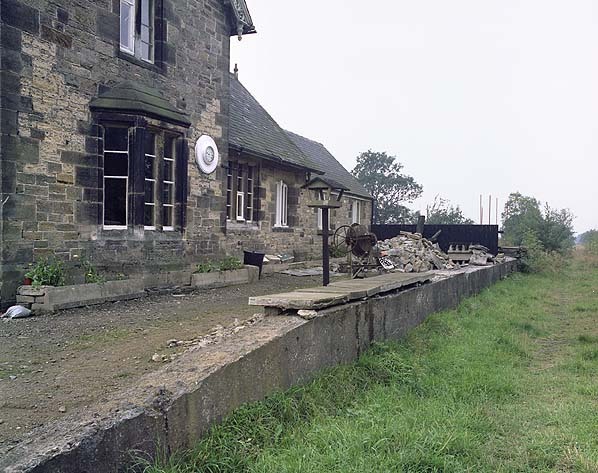 Catterick Military Railway: Brompton Road (1st site), Brompton Road (2nd site), Camp Centre, California and Scotton. 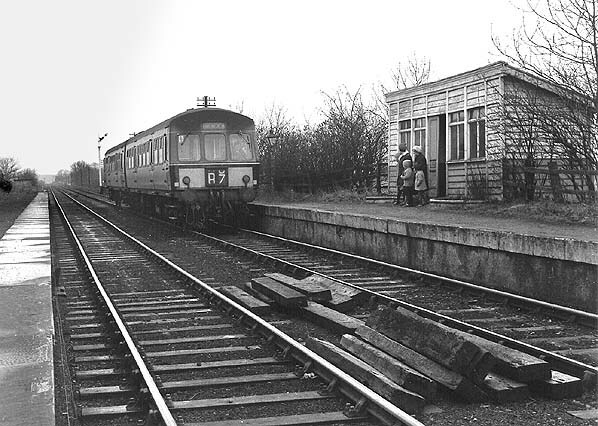 Darlington DMU arriving at Moulton Halt on 3rd March 1969, the last day of public service. Moulton Halt looking south-west in June 2018.